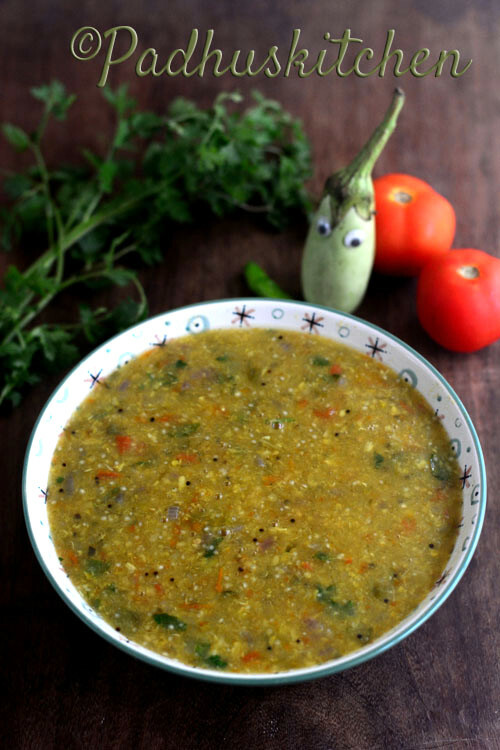 Brinjal kadayal is a quick and easy side dish you can make during the hectic morning hours. This is not a very popular side dish and may not look appealing in the picture but take my words, it is very easy to make and tastes very delicious with idli and dosa. All you have to do is to dump everything inside the pressure cooker, mash it well and then boil adding tamarind water. That's it. Sounds easy isn't it, taste delicious too. Today we will learn how to make brinjal kadayal following this easy recipe with step wise pictures. Soak tamarind in a cup of hot water for 15 minutes. Extract the tamarind juice and discard the pulp. Soak moong dal in little warm water for 10 minutes. In the meantime we will chop all the vegetables. Wash and chop the brinjals into cubes and keep it in water to avoid discoloration. Chop onion, tomatoes, garlic and keep it ready. Slit green chillies. Take a cooker, add moong dal, chopped brinjals (after draining the water), tomato, chopped pearl onion, green chillies, garlic, curry leaves, turmeric powder, salt needed and a cup of water. Pressure cook for 3 whistles. Once the pressure subsides, open the cooker. Strain the water if any and keep it aside. Mash the contents well with a potato masher or a mattu (woodon masher). Add diluted tamarind water and the reserved strained water. Check for salt. This kadayal should be thin, so add water, if it is thick. Boil on low heat, stirring from time to time for a few minutes until the raw flavor of the tamarind goes. Heat a tsp of oil, add mustard seeds, when it splutters, add the chopped onion and curry leaves. Saute until onion turns transparent. Pour it over the brinjal kadal. Garnish with finely chopped coriander leaves. Serve piping hot with idli, dosa or pongal. Note - If you do not have pearl onions, you can also use regular onions but pearl onions recommended. Use local variety brinjals. Avoid using hybrid brinjals for this recipe. What type of brinjal to be used? As there are many varieties in market, confused. You can use any variety brinjals (preferable purple or green) but don't use the big purple hybrid ones. Why not one should be avoided for this recipe? All time favourite... Easy preparation yet too tasty and healthy..